AAVSO Communications was launched in March 2015. The purpose of this monthly email is to highlight new initiatives and ongoing projects in a concise way which we hope you will find informative. Sometimes there is just so much going on that it is hard to keep track of it all. We hope that AAVSO Communications will make it easier for you to see what is happening and follow the links to read more about what interests you. By now, you should have received your first issue. If you are logged into the AAVSO website, subscribe here. If you do not have an account on the AAVSO website, subscribe here. 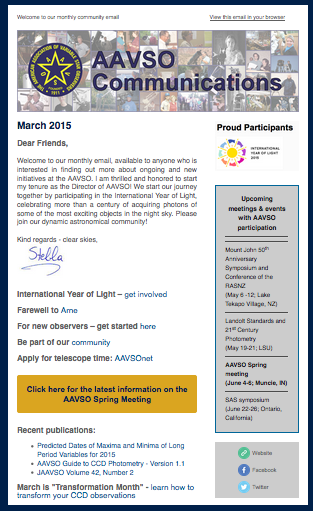 AAVSO Communications is sent out on the first Tuesday of each month. If you are subscribed to it and you do not see it in your inbox, please check your spam or "promotions" folder in case the email has been misplaced. Since we are using a third-party tool to create and send this email (MailChimp) you may have to "train" your email provider to accept it.